Style. Function. Versatility. The 60-inch Brooks vanity will be the cornerstone of your bathroom, providing ample storage within its soft-close drawers and open-shelf base. Featuring a Chilled Gray finish and clean lines, the Brooks embraces a transitional aesthetic that is timeless and pure. Match your vanity with a complementary top, mirror and medicine cabinet to complete the design of your dreams. Prominent, sharp lines give this 72-inch double vanity an elegant look that will be the envy of friends, relatives and your contractor. Natural birch and veneer wood grains burst from a light espresso finish on this classic-style cabinet to evoke a sense of warmth and harmony. Beyond four inset doors lies a spacious interior where an abundance of bathroom accessories can be stored above or below four fastened shelves. Additionally, three middle drawers offer more storage space for powder room essentials. Complement this vanity with light espresso-finished wall mirrors or a linen tower from the Avanity Madison collection to give your bathroom a rejuvenated vibe. Berkeley 60-Inch Vanity Cabinet with Mirror in Dark Chestnut If your bathroom's asking you for a facelift, the Berkeley is a worthy choice. At once elegant, classic and contemporary, the Berkeley vanity lends an air of sophistication and charm to any bathroom, from a Soho penthouse to a rustic country home. Carefully hand built to last for decades and finished in Dark Chestnut or White, this solid wood vanity has counter options to compete the timeless look. Available in multiple sizes and finishes. 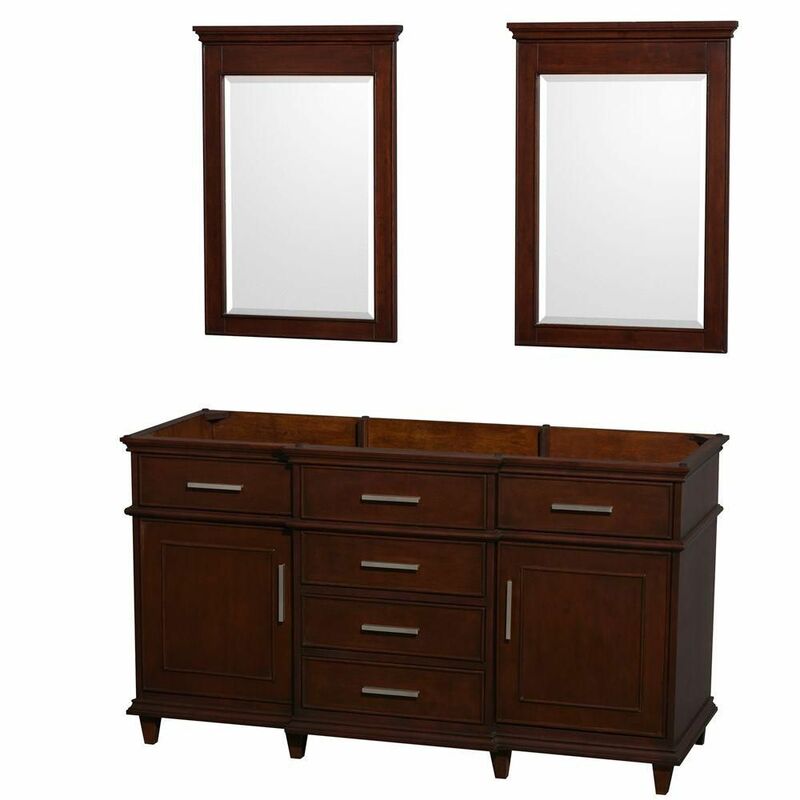 Berkeley 60-Inch Vanity Cabinet with Mirror in Dark Chestnut is rated 4.0 out of 5 by 2. Rated 3 out of 5 by arrow from A lot of the drawers stick. It is beautiful, but none of the drawers work very well which has been frustrating--the gentle close feature didn't work at all out of the box or the drawers weren't seated right and would stick.